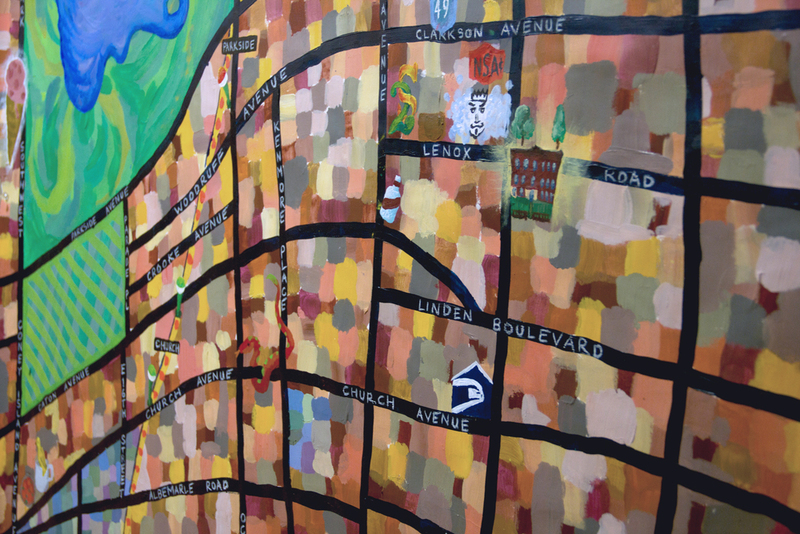 Months after moving in and weeks after he finished painting it, Sam's neighborhood map has been hung in its rightful place in our foyer. And more importantly, he has created photographic proof that all is said and done. 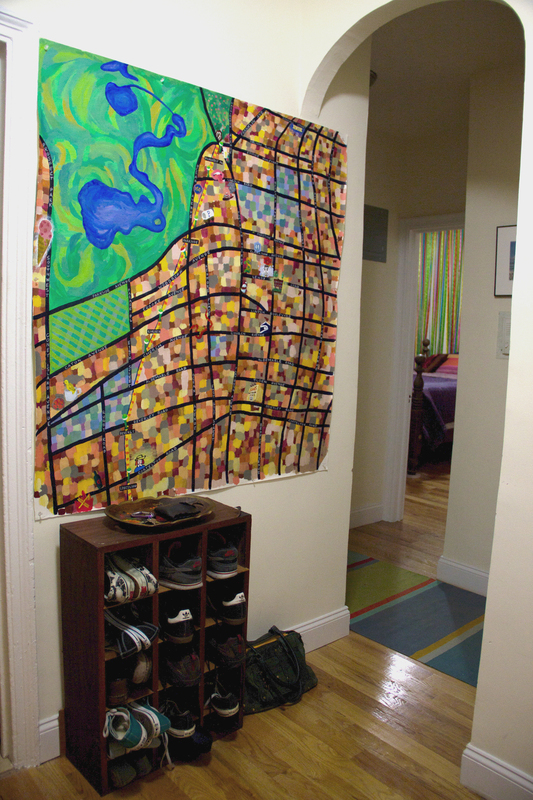 The idea for this map was inspired by the Ditmas Park collage map that Sam hung in our last apartment for a few years (Matt Mullin did a nice little tumblr post too!). That original map was a creative outlet for Sam when indy film work was sparse and soul-sucking side jobs were helping to pay rent. The idea for this map was also conceived during a time of difficulty for us — we discovered bedbugs on our first night in our new apartment. We took swift action and had the apartment treated, sealed off the cracks and crevices, heat treated everything we could, and even dealt appropriately with a few "strays" that have come along in the months since. After we were finally allowed to unpack we started hanging things on the walls and Sam decided it was time to make a new map. And now we can enjoy it and put all the bad memories of this apartment behind us. The moment the front door swings open you see this! The full map of Prospect-Lefferts Gardens and surrounding points of interest. Sam knew he wanted to include our dear friend Matt Mullin's house on Carroll Street in the map so that gave him his topmost point. 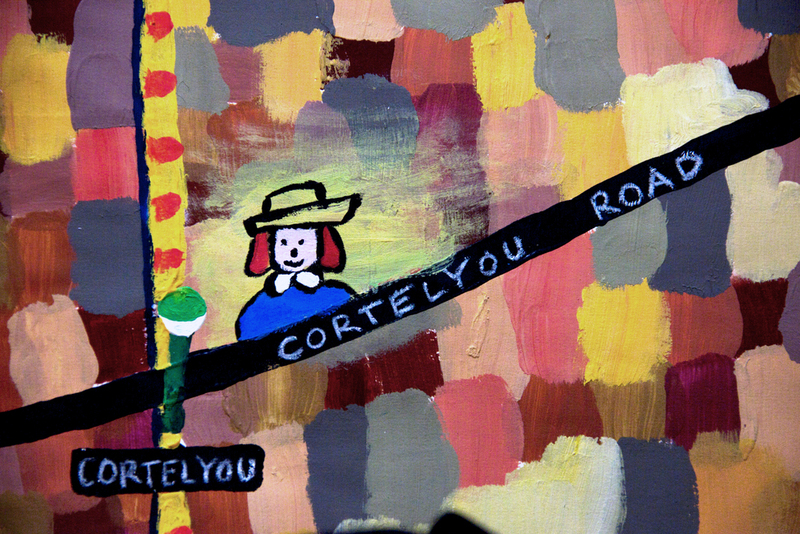 He also knew that he wanted to include Cortelyou Road, so that is the southern point. The width was determined by the width of the photo backdrop paper that Sam painted on. He intentionally distorted the grid to emphasize points of interest and left several streets off entirely for simplicity. The dense cityscape is created with a loose patchwork of colored blocks — warm neutrals for regular blocks, cool colors for historic districts. Prospect park uses more organic shapes while the Parade Grounds (the location of many of the ball fields for Prospect Park) are a green plaid. The southern part of the Brooklyn Botanical Gardens is also green with splotches of pink that remind us of the cherry blossoms and various other flowers that make the BBG so special. As he started to add more structure, Sam added the B/Q subway line along with the little green and red globes that subway entrances and exits. The southern exit of The Q at Parkside Avenue. When it came to adding points of interest, Sam played up the names of businesses, getting very imaginative. He added personality to the generically named 2S Mart where we get vegetables late at night after the NSA Grocery store or Pioneer Supermarket have closed. He also included our tiny, bullet-proof glass encased liquor store where we pick up a very limited selection of wine. You can see the very clever logo for our laundromat, Laundry King, recreated. And of course our apartment building has been adorably rendered with a homey glow emanating from it. Although it will get taken down again when we leave, I wouldn't mind hanging this up in our next place as a reminder that even in the face of difficult situations, both of us can find inspiration and creativity.